It was a year of opportunities and challenges — anticipated and unexpected — and FedEx emerged more competitive than ever. Our consolidated financial results attest to our successful corporate strategy of managing FedEx as a portfolio of business solutions, allowing us to respond to marketplace changes quickly and efficiently as we continue to provide outstanding service to our customers. FedEx Express posted solid revenue growth and is on track to reach our target to improve operating income by $1.2 billion to $1.5 billion in fiscal 2020 versus fiscal 2017 assuming moderate economic growth, stability in global trade, and current accounting rules and tax laws. Strategic investments in FedEx Ground automation and capacity to handle both business-to-business and e-commerce growth are paying off. FedEx Ground revenue share continues to grow and margins are rebounding. FedEx Freight margins are steadily increasing due to an improved industrial business environment and a better balance of volume, pricing, and capacity. Our leading-edge technologies now allow customers to conveniently pick up, drop off, or ship at more than 50,000 locations nationwide. FedEx delivered another holiday shipping season of record volumes and high service levels due to our flexible networks and disciplined year-round planning. Our successful ability to handle average daily volumes that can double during peak is a feat no other company can accomplish on a global scale as well as FedEx can. I want to recognize our team members for delivering critical relief in the wake of devastating hurricanes, floods, earthquakes, and wildfires in FY18. Our logistics expertise helped connect organizations, communities, and individuals, and we quickly transported aid in response to the unprecedented scope of these disasters. Also remarkable was the job the FedEx Express team did to manage through the crippling cyberattack which affected our newly acquired TNT Express subsidiary. FedEx team members are committed to the Purple Promise. It sets the bar for excellence, helping earn the trust and loyalty of our customers and making FedEx one of the most admired companies in the world and a great place to work. The Purple Promise tells you everything you need to know about what we expect out of our people every day. At FedEx Ground hubs, high-tech helpers work alongside team members for maximum efficiency. Hub expansion and technology investments make FedEx Ground the most highly automated ground network in North America, if not the world, and position us for greater long-term success. Automation and added capacity keep us ahead of the competition in terms of handling e-commerce growth and managing costs while increasing safety and productivity. We continue to gain revenue market share, and our focus is on maximum utilization of our investments and managing our existing capacity to moderate capital spending. 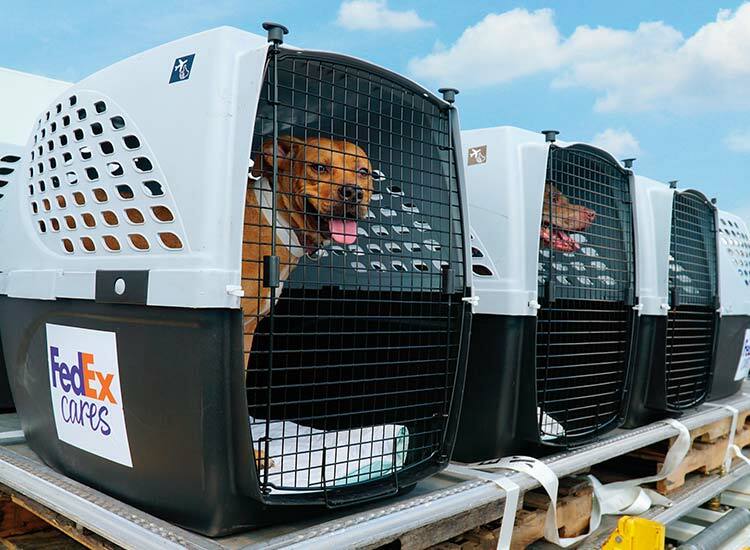 Now with over 130 automated facilities, our unmatched FedEx Ground network is better able to flex up to accommodate holiday volumes, and we can reroute and sort packages at any hub to better serve customers in weather contingencies and other unexpected situations. To boost productivity, we are further implementing robotics technology so team members can focus on jobs requiring higher skills. 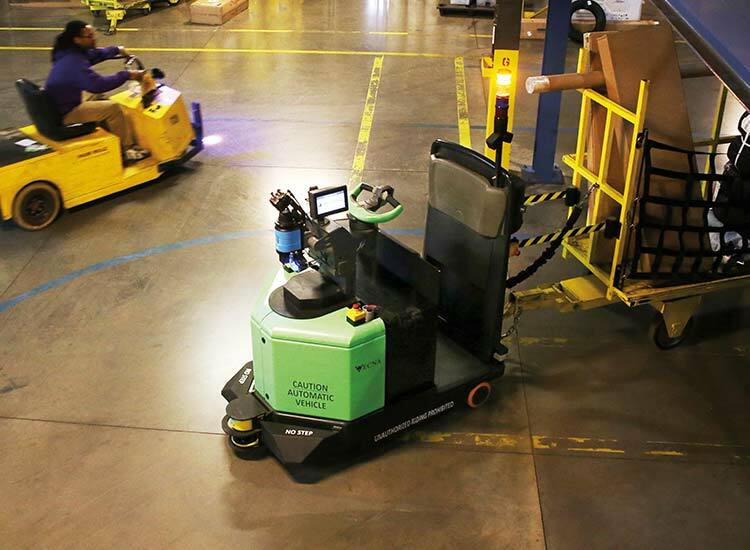 Self-driving tugs are moving large or overweight packages through hubs, and we’re testing automated devices that can unload shipments from our trucks. FedEx Express is meeting the pilot-shortage challenge head-on with an innovative new program. We are continuing our very successful aircraft fleet modernization strategy. By replacing older aircraft with newer models, such as the Boeing 777F which burns 18 percent less fuel per pound of payload and produces 18 percent fewer emissions compared with the MD-11 it replaces, we save fuel and reduce emissions while enhancing operational flexibility and improving operating margins. Last year, for example, the aircraft fleet modernization program saved 89.3 million gallons of jet fuel, avoiding more than 860,000 metric tons of CO2e (carbon dioxide equivalent) emissions. 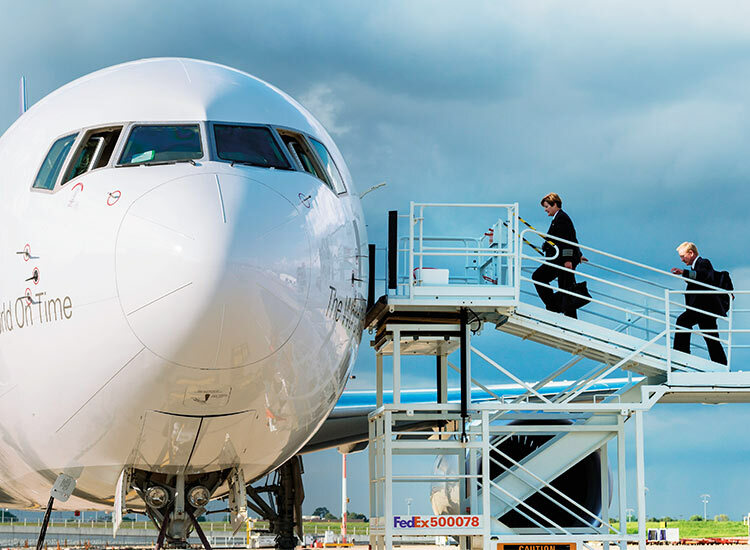 This year, a Boeing 777F built for FedEx Express was our first plane to fly 100 percent on biofuel. Through modernization, FedEx remains the world’s largest, fastest, and most innovative all-cargo aircraft fleet. During FY18, we launched an industry-leading pilot-development plan, Purple Runway, designed to address the anticipated shortage of aviators in coming years. To serve smaller markets more effectively, we’ve agreed to purchase 30 ATR 72-600F turboprop freighters with large cargo doors customized for FedEx. We worked closely with ATR which developed this new aircraft with special features to help us grow our business, especially in the air freight market where shipments are larger and heavier. In the same vein, for smaller markets, we have ordered 50 newly designed Cessna SkyCourier C-408 twin turboprops. These aircraft have nearly double the volume capacity of our current single-engine Cessnas. The C-408 will have larger cargo doors to support seamless freight movement throughout our air network connecting with our larger jet transports. When disaster strikes, our powerful global network is prepared to quickly mobilize and deliver aid. Customers increasingly seek specialized logistics and e-commerce solutions to compete in today’s marketplace: Think temperature-controlled shipping for healthcare businesses, customs clearance, or e-commerce fulfillment. We’ve combined our specialty operating companies within FedEx Trade Networks to make it easier and more efficient for customers to achieve their business objectives. The specialized FedEx companies under the new organization offer a wide range of air cargo and ocean freight services; inventory warehousing and distribution; e-commerce fulfillment; customs brokerage and trade facilitation; secure payment technology; and forward logistics and 3D printing. To support rapid e-commerce growth worldwide, we recently acquired global e-commerce transportation solutions provider P2P which offers unique low-cost delivery options leveraging its relationships with private, postal, retail, and clearance providers in over 200 countries and territories. Technology and information have always been the backbone of FedEx customer solutions. It is essential we operate on the edge of new technology, and in this spirit, FedEx joined the Blockchain in Transportation Alliance (BiTA) to explore this new technology within the logistics sector. We’re confident that blockchain has the potential to significantly improve worldwide supply chains. It is significant that a FedEx proposal was among 10 accepted by the U.S. Transportation Department to assess how to regulate drones and integrate them safely into U.S. air space. We plan to employ drones to deliver aircraft parts and inspect aircraft and runways at the Memphis World Hub. FedEx stands at the nexus of virtual and physical networks, a crucial intersection for the success of e-commerce deliveries. As the industry grows and customer expectations for convenience and security increase, we continue to expand our technology capabilities and retail footprint which work hand in hand. 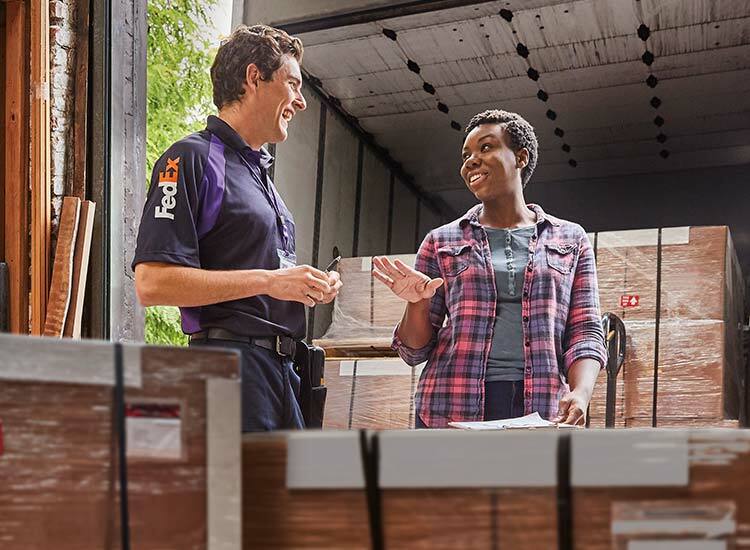 FedEx Delivery Manager® makes it simple to track, schedule delivery, reroute packages, and more, supporting businesses and consumers alike. It is now available in 42 countries covering 74 percent of the world’s GDP. To make returns easier for e-tailers, our new FedEx Returns Technology allows customers to initiate returns online, view return status, and receive early credits for returns at FedEx Office locations. We continue to grow our retail network to make it more convenient for consumers to ship and have shipments held for pickup. Now U.S. consumers can pick up their packages at any of 11,000 convenient, secure locations, including more than 8,000 at well-known retailers such as Walgreens. Moreover, we’re placing 500 new FedEx Office locations within Walmart stores nationwide. As a result, 80 percent of the U.S. population is within five miles of a FedEx hold location. As our mission statement notes, safety is our highest priority. Nearly all of our FedEx Freight linehaul tractors are equipped with advanced safety features, including telematics, collision mitigation, lane-departure warning, and roll-over stability. We also ordered 20 fully electric Tesla Semi trucks. These innovative trucks will be equipped with safety technologies such as surround cameras, automatic emergency braking, and lane-departure warning. These initiatives support our commitment to improving road safety while also reducing our environmental impact and fuel costs. Best wishes to FedEx Freight President and CEO Mike Ducker as he retires. 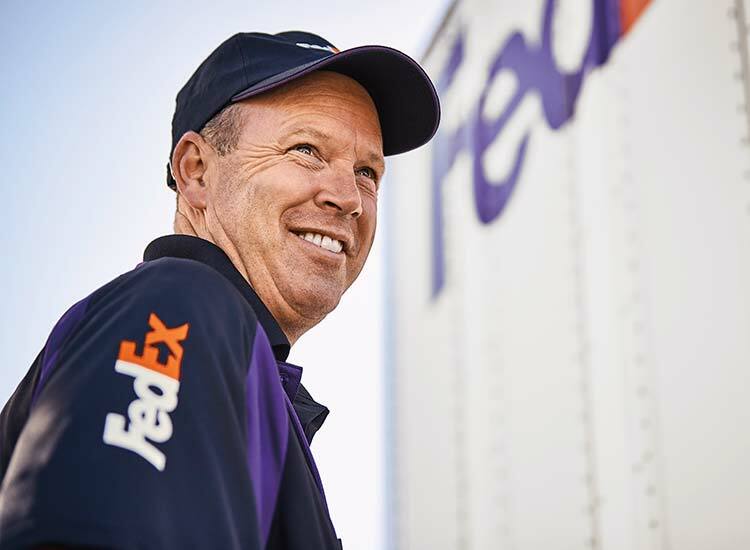 For more than 43 years, Mike answered the call when FedEx asked him to lead in each new opportunity and role. Whether in Europe, Asia, or the Americas, Mike has been a model of our People-Service-Profit philosophy. Succeeding Mike is John A. Smith, former senior vice president of operations at FedEx Freight, who brings more than 32 years of experience in the transportation industry. FY18 began with outstanding progress in our base business and in the integration of TNT Express, our biggest acquisition to date. In late June 2017, however, TNT information-technology systems were decimated by an unprecedented, nation-state-sponsored cyberattack against Ukraine causing business and financial damage that lingered for months. The size and scope of the attack were historic. Most important, however, was the Herculean effort by determined FedEx team members to mitigate the attack and turn adversity into an advantage. We did so by accelerating integration, fast-tracking information-technology modernization, and launching a number of customer-relationship initiatives. The recovery effort was one of the most remarkable accomplishments I have seen in the history of FedEx. I am pleased to report we are seeing strong TNT service levels, and the integration is rapidly progressing. Our everlasting thanks go out to the teams that worked tirelessly around the clock and around the world to restore the systems and make them more secure, and to our customers for their trust. I’m confident we will emerge from this monumental challenge stronger than before. May 2018 marked the second anniversary of the TNT acquisition — two years of extraordinary collaboration between FedEx Express and TNT team members uniquely strengthened by the massive cyberattack. We’re investing more than $4.2 billion in our people and our network as a result of the tax act. Another historic but much more positive episode for U.S. business and FedEx was the approval of the U.S. Tax Cuts and Jobs Act which is increasing business investment and expanding GDP. We are exceptionally proud of the significant role FedEx Tax, Legal, and Government Affairs team members played in advancing this much-needed tax code modernization which was essential to improving the competitive landscape for U.S. businesses. In response to the Act, we announced a $4.2 billion commitment to: 1. Accelerate wage increases for certain hourly employees, 2. Restore incentive compensation diminished because of the cyberattack, 3. Strengthen our pension plan, 4. Increase capital investments, including modernizing and expanding the FedEx Express Memphis and Indianapolis hubs. These actions reflect our People-Service-Profit philosophy and our commitment to take advantage of the lower corporate tax rate and the capital expensing provision. It is clear that trust and reliability remain paramount to our customers and are among our most critical competitive advantages. FedEx team members worldwide earn that trust every day by delivering the Purple Promise to customers and to communities we serve. This dedication was again recognized by FORTUNE which included FedEx among its Top Ten World’s Most Admired Companies and 100 Best Companies to Work For. In April 2018, FedEx marked its 45th year in operation and climbed to No. 50 on the Fortune 500 list of U.S. companies ranked by total revenues as of Dec. 31, 2017. Total revenue for FY18 was $65.5 billion. We are justifiably proud, but looking forward, we know FedEx must remain strategic, nimble, and flexible as global markets evolve. FedEx is committed to increasing our earnings, margins, cash flows, and returns while investing for long-term success. We believe our shareowners, team members, and customers will reap the benefits of this approach by creating sustainable, differentiated capabilities. In all my years at FedEx, I have never been so optimistic, so sure of our strategy and our ability to deliver an exciting future. It’s going to be a great time for everyone who wants to be involved in this fantastic enterprise called FedEx.